WISER has started a unique training course recently. Nationally known respiratory care expert Tom Roop, along with a team of local instructors, have started an interactive video class with physical therapists at ISMETT (Istituto Mediterraneo per i Trapianti e Terapie ad Alta Specializzazione), the UPMC managed transplant hospital at Palermo Sicily. There are no formal training opportunities in respiratory care in Italy at this time and this training is to help introduce physical therapists to this aspect of healthcare. These weekly sessions cover all aspects of respiratory therapy, from patient anatomy to ventilator management. They use video and desktop presentations and interactive sessions over the internet. On June 27, 2012, WISER incorporated a session utilizing remote controlled manikins for enhanced training. 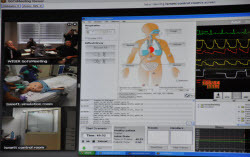 The RT instructors in Pittsburgh controlled the manikin while they observed the students doing scenarios in Palermo using cameras connected to GoToMeeting software. The instructors manipulated the physiological parameters of the manikin in real time based upon the actions of the students. The students where then debriefed after the sessions by the remote instructors using the same cameras. These sessions will continue through October 2012.